On September 21st, PaTTAN’s Harrisburg conference center buzzed with about two dozen energetic Teen Reading Lounge educators, artists and librarians. 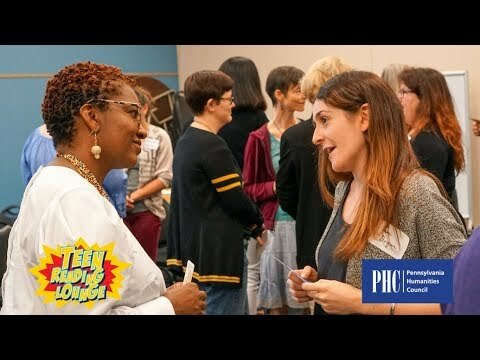 Each year the Pennsylvania Humanities Council gathers this passionate and diverse group together to prepare for the next round of the program, deeply connecting the participants to both the why and how of Teen Reading Lounge. Toward that end, activities ranged from the reflective (periods of focused meditation) to the pragmatic (modeling effective teen ice-breaking activities.) This year’s Teen Reading Lounge kick-off workshop was orchestrated by the charismatic Fatima Hafiz, a professional coach from Transformative Education Associates, who led a series of creative and sometimes unorthodox activities meant to increase effectiveness with engaging young people. “I don’t know if the workshop is typical of professional development workshops, however, I do know that when adults can connect with their passions and the things that matter to them, they become better equipped to serve young people,” said Hafiz. Fatima Hafiz, a professional coach from Transformative Education Associates, led the Teen Reading Lounge Kick-Off Workshop. The workshop’s unique approach is appropriate for Teen Reading Lounge, which Pennsylvania Humanities Council describes as a “non-traditional book club.” Teens are put in the driver’s seat -- they select the book, choose projects and direct the conversation. At a time when the lives of young people are often highly regimented, Teen Reading Lounge can be an oasis of freedom and creativity away from the ever-encroaching demands of adults. The role of facilitators and other adults is to create a space where teens feel free to express themselves while providing appropriate institutional support and helping to focus energy and resources around the humanities. As solutions and ideas bubbled up they were taped to the walls, surrounding the room with supportive insights. The regular trainings, webinars, community of practice calls, and site visits provided by the Pennsylvania Humanities Council intend to guide and encourage facilitators while networking them with peers at Teen Reading Lounge locations throughout the state. “Youth development occurs when those who are serving youth are also developing,” said Hafiz. Participants shared strategies and ideas throughout the workshop. Jacki Clark, facilitator and site coordinator at Muhlenberg Community Library. Participants expressed heartfelt appreciation for the workshop throughout the day and also later in responses to a Pennsylvania Humanities Council feedback survey. “The workshop was incredibly satisfying to my soul,” observed Jacki Clark, a Teen Reading Lounge facilitator and site coordinator at Muhlenberg Community Library. “The lack of pressure of the setting, the ability to have open ended questions and dialogue with others, both new and seasoned, is so refreshing.” Clark’s group of teens back at Muhlenberg has now grown so large that she’s scrambling to make new accommodations. Since its development in 2010, Teen Reading Lounge has spread to over 80 sites across Pennsylvania, including both public libraries and other out-of-school-time sites. Glenn Miller, Deputy Secretary and Commissioner for Libraries for the Pennsylvania Department of Education’s Office of Commonwealth Libraries, which contributes funding toward the statewide program, stopped by to observe some of the workshop. “Your own commitment to this, your own energy, your own passion for reaching these kids and bringing them in and empowering them -- this makes such a difference," he told the group. Glenn Miller, Deputy Secretary and Commissioner for Libraries for the Pennsylvania Department of Education’s Office of Commonwealth Libraries. During the simulated teen discussion session that passion and commitment was evident. The group was organized into a “fish bowl” formation with one circle of seated participants inside another. Led by a designated facilitator, the inner circle read and discussed a short selection of text from a popular or classic work that dealt with issues of race or mental health. The outer circle quietly observed, but if they felt inspired to contribute they could join the conversation. The exercise allowed the adults to sit on the receiving side of facilitation while the facilitators were observed for coaching and feedback. Similar to real Teen Reading Lounge groups, the adult discussions were wide-ranging with plenty of thoughtful digression in between. At times, emotions ran high, especially around the topic of racism, providing an opportunity for the facilitator to constructively guide the conversation. The experience was powerful, with many of the adults revealing personal details of their lives. Like the teens they facilitate, they experienced both the challenges and rewards of being emotionally vulnerable in a safe and supportive group environment. Participants engaged in a series of activities meant to strengthen their skills in facilitating teen discussions.